How did you spend the first day of 2019? We’re willing to bet you weren’t slogging across a frozen river to enter one of the world’s most isolated nations, the Democratic People’s Republic of Korea (DPRK, aka North Korea), like a crowd of tourists in China’s Jilin province did. That’s right, in what is arguably the coolest possible way to spend New Year’s Day (by our estimate anyway), a 120-strong group of Chinese tourists walked across the frozen surface of the Tumen River to visit Rason, North Korea. The visit was part of a new travel program organized by the Hunchun Tourism Bureau called the ‘China-North Korea Tumen River Cross-Border Tour,’ according to Global Times. Admittedly, one China-based DPRK tour operator we spoke with told us that the New Year’s Day tour was definitely not the first tour group to visit Rason from China by crossing the Tumen River. (Although it could be the first to cross the frozen surface of the river). “This is simply tourism in a place that has seen many tens of thousands of tourists enter and exit to and from China over the years and they all have to cross the river in each direction,” the DPRK travel expert told us. It has not been revealed how much the tour participants were charged, but the official that spoke with Global Times said that travel arrangements were organized by “commissioned travel agencies” and that a tourist visa was needed to participate. Once across the Tumen River and inside the DPRK, the Chinese tourists were taken to visit the House of North Korea-Russia Friendship in Rason’s Tumangang town and were treated to renditions of traditional Chinese and Korean songs by their guide, identified as Mr. Lee. 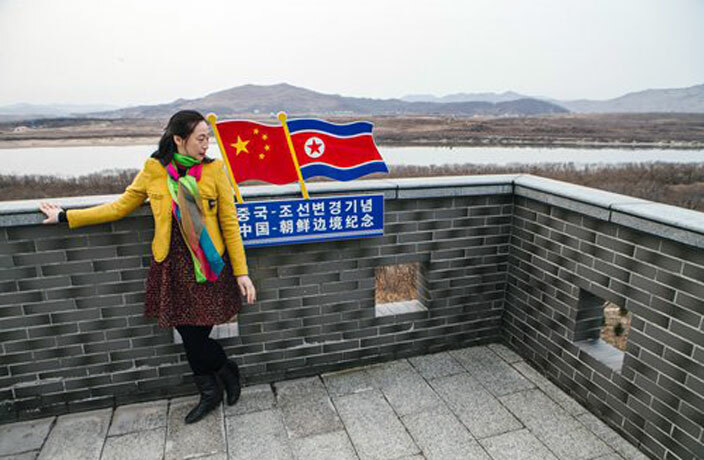 The New Year’s Day visit to Rason was the first of many planned trips from China as part of the ‘China-North Korea Tumen River Cross-Border Tour,’ according to Global Times, and the program will be “in full swing” by the summer months. Once the Tumen is free of ice, the tour groups will be shuttled across the river by boat. Rason is a special economic zone composed of the cities of Rajin and Sonbong, carved out of North Hamgyong province in the country’s northeastern frontier. The special economic zone borders both China and Russia and boasts an ice-free port, which was previously utilized by the Soviets as an alternate port to the facilities in Vladivostok. The man, Michael Spavor, played a key role in arranging Dennis Rodman’s trip to North Korea in 2015. North Korea's national carrier now flies to Shanghai twice a week. Of the 42 found perished so far, at least 13 are children. Nearly 40 dead after a bus carrying dozens of Chinese tourists crashes in North Korea. China urges caution in France after thieves sprayed tourists with tear gas and robbed them. Two Chinese tourists were arrested in Germany last weekend for making the Hitler salute in Berlin. The nation's first 50 bike stations will be positioned close to bus and subway stations. In a written statement released by his parents, it has been confirmed that US student Otto Warmbier has died, less than a week after the release from his detention in North Korea.